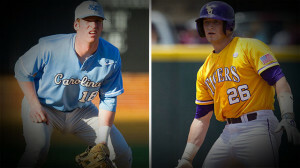 A must win game for both the top ranked North Carolina Tar Heels and fourth ranked LSU Tigers, Tuesday’s elimination game saw both teams come out hitting, but only team would continue on in Omaha. That team is North Carolina, who behind a strong starting effort by reliever Trent Thornton ousted a strong LSU ball club in a 4-2 victory to face the loser of Tuesday night’s contest between the NC State Wolfpack and UCLA Bruins. The Tar Heels led off the game with a two-run first inning behind the bat of Brian Holberton, who launched a two-run home run to right field, scoring Colin Moran and giving North Carolina an early 2-0 lead. North Carolina would strike again in the third on a Colin Moran RBI single that scored Landon Lassiter and gave extended their lead to 3-0. While LSU managed to get contact on the ball and draw walks, they were unable to take advantage and score runs. The Tigers would not score until the bottom of the fifth, wherein an RBI single by Mason Katz scored Sean McMullen to close the gap to 3-1. With two outs in the top of the seventh, Tar Heels right fielder Skye Bolt ripped a single to left to score Moran, extending North Carolina’s lead by three runs. However, the Tigers would counter in the bottom of the frame, scoring a run on an Alex Bregman ground out, pulling LSU within two runs of the lead. The Tigers would load the bases in the bottom of the eighth, threatening to open up the game with one swing of the bat; however, Mark Laird ended the threat by flying out to left to end the inning. Chris Cotton would close out the game for the Tigers in the ninth, cementing a 4-2 victory for LSU. Although Cotton worked 2 2/3 scoreless innings of relief, the hero of the game for the Tar Heels was without a doubt Trent Thornton. Thornton, a freshman who has served as the primary closer for North Carolina this season, pitched seven strong innings on Tuesday, holding the dangerous LSU offense to just two runs. In the effort, Thornton garnered his 12th victory of the season, a Tar Heels record for a freshman. Perhaps even more notable than Thornton’s impressive outing was the lack of offensive production by key members of the LSU lineup. The Collegiate Baseball National Freshman of the Year Alex Bregman went 0-for-8 and Raph Rhymes went 0-for-9 (stranding eight base runners) in two College World Series games. Third baseman Christian Ibarra also finished the season on a 0-for-22 hitless streak. With the powerhouse LSU Tigers out of the way, North Carolina will now move on to face the winner of Tuesday’s game between NC State and UCLA on Thursday for a chance to move closer to bringing home the first NCAA title in school history.